With all of NASA's recent (and historical) explorations and achievements, it's only natural that the visualization masters over at Pop Chart Lab would decide to make a poster dedicated to humankind's expeditions into the final frontier. 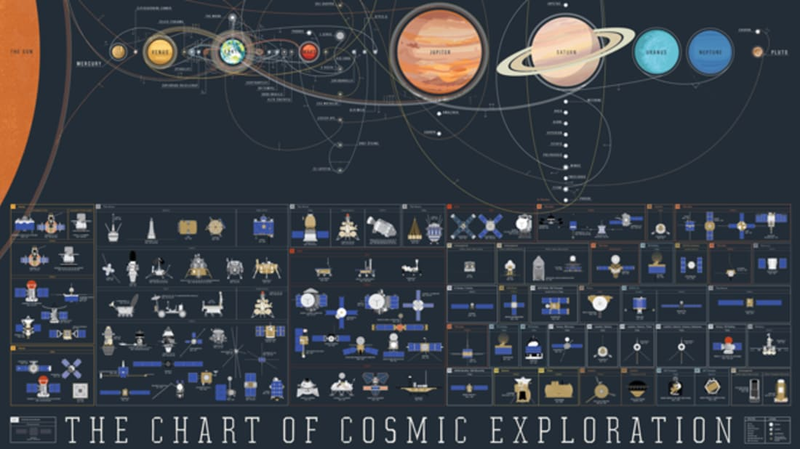 This stunningly detailed poster catalogs all of them—from Luna 2 in 1959 to DSCOVR in 2015. There are over 100 exploratory devices featured, from orbiters to rovers to landers. The color-coded poster traces the path each craft took on its trip through space, weaving a delightful web. Planets, moons, asteroids, and even Pluto appear as points of interest for the cosmic explorers. The work is beautifully hand-illustrated and comes in a "Pop Chart Lab Test Tube," which is essentially a transparent packing tube—perfect for when you need to store it but still want to gaze at its pretty contours. Pick one up for $38 here. Click here for enlarged image.